First of all, you have to understand the original Yalu jailbreak is only support iOS 10 – 10.2 currently. Yalu developer, Luca Todesco hasn’t released any jailbreak for iOS 10.2.1, 10.3 or 10.3.1. Follow our Cydia Installer app to find your jailbreak fast & easily. This app is supported for any iOS version. Just download with your mobile Safari Browser. 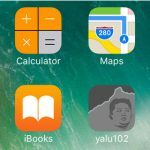 What’s new in Yalu jailbreak modified versions? Modified Yalu versions have fixed minor errors, added more information to the interface and changed the background. They are not included most wanted things like add support more devices or firmware versions to the Yalu iOS 10 jailbreak. Most of them have just modified only the user-interface of yalu102. Yalu Dark has created by the security researcher/iOS developer – GeoSn0w (@FCE365). This is the Dark version of Yalu jailbreak for iOS 10. 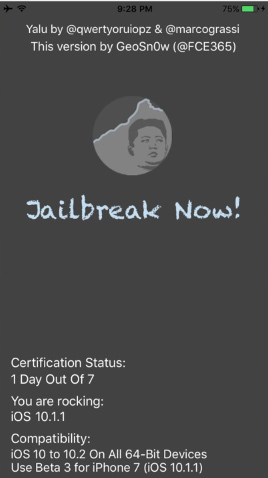 In addition to the dark interface, it shows your iOS version & signing status of jailbreak certificate. Also Yalu Dark fixes some Cydia related errors as well. The latest version (beta 10) of Yalu Dark only displays how many days since installation and removes rest of the things from the user interface. There is a new “i” button, if you press on it you can see a new window that includes more information about the Yalu Dark. 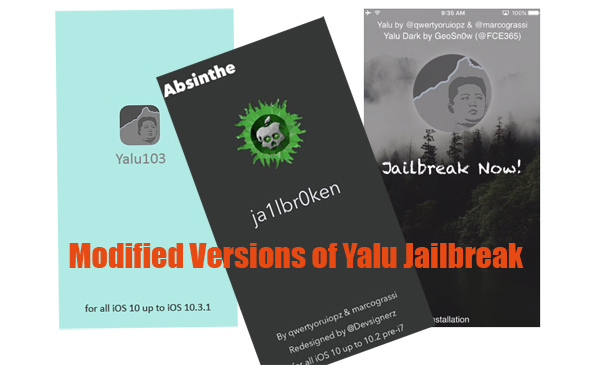 How to jailbreak your device using Yalu Dark & Absinthe versions? 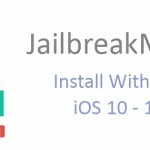 There are so many yalu103 versions promoting on the web and YouTube claiming jailbreak iOS 10.3 & 10.3.1. Please do not download any yalu 103 jailbreak for your device, because it’s completely FAKE. Yalu jailbreak only supports for iOS 10 – 10.2 & Luca also has left from the public jailbreak researches. Why are you get serious risk for your valuable device & data with malicious software? 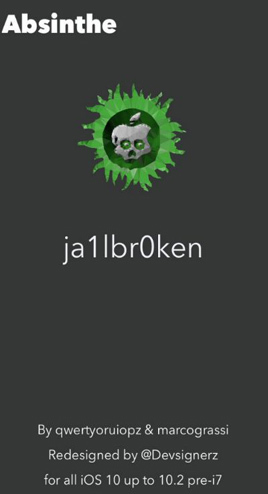 Therefor, please stay away from the things that claim iOS 10.3 / 10.3.1 jailbreak at all , because currently not available jailbreak for iOS 10.2.1 – 10.3.2 firmware. Always download jailbreak tools from the trusted sources. We only provide real & genuine tools & download links for our loving users. Follow us on Twitter, add us to your circle on Google+ or like our Facebook page for latest releases, news & update Cydia – jailbreak related. Yalu 103 is not compatible with iOS 10.3.2 now, Please wait until jailbreak release.